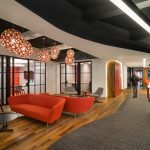 For the government leaders of the Iowa Utilities Board and Office of Consumer Advocate, the design of their new joint headquarters building represented an opportunity to drive change within their organizations and beyond. Before the architect was selected for the proposed new building on the State of Iowa Capitol Complex, the state had established aggressive reduced-energy goals. Following this lead, the IUB and OCA, who are required by state law to share a building, endeavored to design a space that would become a living laboratory of sorts, demonstrating the visionary level of elegant and efficient workspace design that is possible even on a limited state budget. One year after occupancy, this ambitious vision has not only been realized, but exceeded. With a project team that featured close collaboration between BNIM Architects out of Des Moines, Iowa and both the IUB and OCA owners, the building was recognized in 2012 with an AIA COTE Top Ten Green Project Award, given to only 10 of the country’s most hyper-efficient projects. The performance goal for this 44,500 gross square foot office facility was to consume 28.0 kBtu’s or less per square foot per year. This is equivalent to a 60% energy savings when compared to the baseline for a similar building established by ASHRAE 90.1 – 2004. In many ways this clarity and vision for stewardship, inspired by the State‘s commitment to a high performance building, empowered the team to focus on performance strategies with the full support of the owner from inception. To achieve such results, BNIM and a collaborative team including the owner and specialized consultants, utilized an integrated design process. The team prioritized a primary goal to initially employ passive strategies to achieve the energy and performance goals of the facility supported by appropriate building systems. The team then established LEED Platinum rating as a secondary goal, giving elevated importance to a range of sustainable strategies such as stormwater management, water conservation and responsible material use. A diverse and comprehensive set of strategies was employed in the design of the IUB/OCA. The project is a figural and literal threshold to the powerful example that government can provide when resources are properly stewarded and it is a demonstration of replicable strategies for performance and savings. Further, for the employees of IUB/OCA, the hyper-focus of the building’s energy efficiency features is a physical reminder of the importance of their role in the conservation of the resource they regulate. The project’s early design concepts concentrated on east-west building orientation and a narrow footprint to maximize daylighting as well as passive heating and cooling opportunities. The building’s location on the site provided opportunities to reduce development requirements through the creation of shared conferencing facilities, utilization of existing campus facilities and parking and reduction of pavement by building adjacent to existing roads. The Iowa climate is one of hot and cold extremes, so the team innovated details to eliminate thermal bridging in the envelope. Several technologies, such as a white Thermomass precast concrete system and uninterrupted use of insulation throughout the building structure help to modulate temperatures and reduce loads. This helps support occupant comfort and maximize working conditions. To contribute to a healthy and productive workplace, over 98% of regularly occupied spaces in the workplace have access to daylight and views through the north and south elevations. Daylight harvesting sunscreens comprised of horizontal blades and vertical fabric panels on the south elevation of each wing reflect daylight deep into the office space during all seasons, block unwanted summertime heat gain and allow passive winter heating. Among other strategies, the team focused on features such as solar tube skylights at the building core to deliver additional daylighting to workspaces. Light sensors integrated into the building automation control system continuously dim light fixtures in response to available natural light. All employees have access to operable windows to allow natural ventilation during favorable conditions. The building automation system is tied to an onsite weather station which identifies favorable and unfavorable exterior conditions, sending an email to occupants to inform them when windows can be opened and when they should be closed. The automation system also disables the associated zone’s heat pumps when windows are open to ensure energy is not wasted. Open office workstations are positioned at the south portion of each wing to take advantage of the further reach of harvested southern daylight, while enclosed offices are placed toward the north to benefit from soft, less deep northern light. Interior spaces are fitted with glazing to borrow available light from adjacent spaces. The team performed daylight simulation exercises to determine the best workstation design. Open-office workstations demonstrated a significant performance increase when low 36-inch tall furniture panels with 16-inch translucent upper panels were used in lieu of higher partitions or cubicles. At the core of the building, the workstations supported the required lighting levels at the work surface without artificial lighting 70% of the time (vs. 30% of the time with owner’s previous 64” tall furniture). All outlets were designated as critical power, non-critical power or task lighting to control usage. Open office and enclosed office outlets are tied to occupancy sensors that shut down all non-critical loads when not in use. Task lighting circuits are individually monitored as part of a larger daylighting study within the building to understand the extent of savings and total energy use assigned to artificial lighting. Measurement and verification is integral to the continued development and success of the facility. The metrics of the IUB/OCA Building are continuously monitored and documented through a partnership with the State of Iowa Department of Administration and the Iowa Energy Center. Nearly every outlet can be monitored and real-time data is analyzed to develop opportunities to improve building performance. The Iowa Energy Center will further use results to support various research projects. This deliberate combination of strategies has enabled the IUB/OCA Building to not only meet, but exceed the targeted performance established by the Owner. After 12 months of occupancy, the building is consuming 22.4 kBtu’s per square foot per year, a 68% energy savings below ASHRAE 90.1-2004 requirements, prior to consideration of on-site renewable energy production. The owner notes that increased collaboration is among the many benefits that employees of both organizations enjoy in this new workplace. The workstation configurations have promoted increased collaboration between the teams that work on cases before the Board of Utilities. Larger shared and common spaces such as the Hearing Room and two large conference rooms offer flexible space which performs well for many purposes, including training, small or large group meetings, and the intended use, hearings. The result is a headquarters building that demonstrates how an elegant, high performance workspace that inspires high performance people can be achieved within the limitations of state budgets. IUB/OCA is a testament to integrated design, close collaboration, and the power of a focused and bold client partner. Architect/Designer – BNIM Architects Inc.